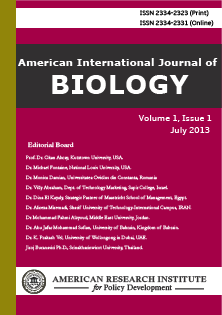 American International Journal of Biology is an international journal devoted to rapid publication of original research and review articles in all biology fields. The aim of this journal is to become the premier source of high quality research. Contributions are welcome from all over the world. The journal is published bimonthly. The aim of the editors is to publish timely, useful and informative results that will be of value to a general biological audience. Every article published in our journal is promoted to researchers working in the respective field. All research articles published in the journal have undergone rigorous peer review, based on initial editor screening and anonymized refereeing by at least two anonymous referees. Each paper published in American International Journal of Biology is assigned a DOI®number, which appears beneath the author's affiliation in the published paper. Click HERE to know what is DOI (Digital Object Identifier)? Click HERE to retrieve Digital Object Identifiers (DOIs) for journal articles, books, and chapters. Dr. Linda Gao, Department of Chemistry, University of Mary Hardin-Baylor, USA. Prof. Dr. R.-L. Etienne Barnett, University of Atlanta, USA. Dr. William Smith, American Research Institute for Policy Development, USA. Thresa O. Corcoro, PhD, Professor of Natural Sciences, Notre Dame University, Philippines. Jiban Shrestha, Scientist (Plant Breeding and Genetics), Nepal Agricultural Research Council, National Maize Research Program, Rampur, Chitwan, Nepal. Dr Khathutshelo A. Tshikolomo PhD, Department of Agriculture, Limpopo Provincial Administration, Republic of South Africa. Dr. Simone Badal, Natural Products Institute, University of the West Indies, Jamaica, WI. Dr. Bassey Okon, Department of Animal Science, University of Calabar, Nigeria.